For most thoracic surgeries (lung resection, esophagectomy) the main purpose of inserting a double lumen tube for lung isolation is providing space for dissection and preventing lung motion by not ventilating (collapsing) the lung undergoing surgery. In addition, during pleurectomy/ decortication surgeries, the anaesthetist can indirectly perform the dissection of pleura from the lung without scrubbing, gloving or holding the scalpel. This is accomplished by ventilating the lung undergoing surgery, with large tidal volumes while the surgeon provides static traction to the visceral pleura. These phases alternate with one lung ventilation. A detailed account of anaesthesia for pleurectomy/ decortication follows. Keywords: Anaesthesia, Double lumen tube, Pleurectomy / Decortication, Malignant mesothelioma. No solitary variable is powerful enough to predict pulmonary complications in the thoracic surgical population. Insight into the lung pathology, its effect on pulmonary function, the nature of pleurectomy decortication surgery with its unique ventilatory requirements and physiology of one lung ventilation (OLV) is essential for optimum management. The fibrous tissues that get deposited in the pleural cavity over the lung parenchyma can be so intense that the underlying lung fails to expand and needs to be decorticated [1Sugarbaker DJ. Macroscopic complete resection: the goal of primary surgery in multimodality therapy for pleural mesothelioma. J Thorac Oncol 2006; 1(2): 175-6. [http://dx.doi.org/10.1016/S1556-0864(15)31536-7] [PMID: 17409850] ]. In pleurectomy decortication surgeries, pleural dissection can be aided by tailored lung inflation and deflation manoeuvres(by the anaesthetist) on the lung being operated [2Bhattacharya S, Dubey PK, Kumari R. Intraoperative ventilation strategy in a patient with empyema thoracis complicated by bronchopleural fistula. Egypt J Cardiothorac Anesth 2016; 10: 57-9. [http://dx.doi.org/10.4103/1687-9090.200284] ]. Asbestos and mesothelioma are so strongly co-related that mesothelioma is considered a “signature tumor” for asbestosis [3Rintoul RC, Ritchie AJ, Edwards JG, et al. Efficacy and cost of video-assisted thoracoscopic partial pleurectomy versus talc pleurodesis in patients with malignant pleural mesothelioma (MesoVATS): an open-label, randomised, controlled trial. Lancet 2014; 384(9948): 1118-27. [http://dx.doi.org/10.1016/S0140-6736(14)60418-9] [PMID: 24942631] , 4Roggli VL, Sharma A, Butnor KJ, Sporn T, Vollmer RT. Malignant mesothelioma and occupational exposure to asbestos: a clinicopathological correlation of 1445 cases. Ultrastruct Pathol 2002; 26(2): 55-65. [http://dx.doi.org/10.1080/01913120252959227] [PMID: 12036093] ], but our patient did not give a history of asbestos exposure. Rare causes of mesothelioma include chest radiotherapy, intrapleural thorium dioxide contrast, simian virus 40 infection and fibrosilicate (talc) inhalation [3Rintoul RC, Ritchie AJ, Edwards JG, et al. Efficacy and cost of video-assisted thoracoscopic partial pleurectomy versus talc pleurodesis in patients with malignant pleural mesothelioma (MesoVATS): an open-label, randomised, controlled trial. Lancet 2014; 384(9948): 1118-27. A 47-year old lady presented with right shoulder pain since 1.5 months. Her positron emission tomogram (PET) CT of chest showed a metabolically active, pleural based, soft tissue mass in right upper lobe, right pleural deposits and moderate right pleural effusion with collapse of right lower lobe. Fine needle aspiration cytology and pleural fluid cytology were positive for malignant cells. A thoracoscopic biopsy was suggestive of malignant mesothelioma and 1.1L of haemmorhagic pleural fluid was removed. Her costal, diaphragmatic and mediastinal pleura was studded with malignant nodules. Talc slurry pleurodesis and two cycles of paclitaxel and carboplatin based chemotherapy followed. She was posted for right pleurectomy decortication. Her haematological and biochemical investigations were within normal limits. Her echocardiogram showed a left ventricular ejection fraction of 60% with no regional wall motion abnormalities. Pulmonary function test showed a restrictive pattern. Intraoperative image of VATS pleurectomy/ decortication patient with double lumen tube in situ. An epidural catheter was placed in T10-11 interspace. Central venous pressure line was not placed since the patient had a right internal jugular venous chemoport in situ. Left radial artery was cannulated and a baseline arterial blood gas sample taken. A 16G peripheral intravenous cannula was secured and 1mg midazolam and 0.2mg glycopyrrolate given. Anaesthesia was induced with intravenous fentanyl100 µg, morphine 4.5 mg, propofol 60mg and atracurium 65 mg. A left sided double lumen tube (DLT; size 35F; Mallencrodt) was orotracheally inserted and fixed at 27cm mark. After auscultatory and fibreoptic confirmation of DLT placement, the patient was placed in left lateral decubitus position and OLV commenced Fig. (1 ). The thoracoscopic camera port was put within the 7th intercostal space and video assisted thoracoscopic surgery (VATS) decortication was attempted through three ports. Parameters set were 350 ml tidal volume, 16breaths/min respiratory rate and 5 cmH2O positive end expiratory pressure. Peak airway pressure was between 27 to 30 cmH2O during OLV and SpO2 was 98 to 100% at FiO2 of 1. Anaesthesia was maintained with oxygen, sevoflurane(0.4-1%), BIS(bispectral index) guided propofol infusion and peripheral nerve stimulator guided atracurium infusion. Intermittent ventilation of the surgical lung was used to assess the completeness of the decortication during dissection. The patient was manually ventilated keeping the adjustable pressure limiting valve at pressure of 40mmHg and the site of surgery flooded with sterile water to detect bubbling of air. 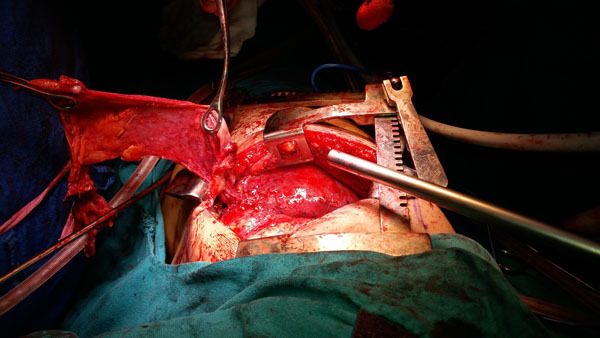 Due to inadequate expansion of the lung to fill the chest area, VATS was converted to right posterolateral latissimus dorsi preserving thoracotomy with right pleurectomy decortication, wedge excision of right upper lobe pleural based nodules with excision of right diaphragmatic nodule, mediastinal lymph node sampling and excision of right tube thoracostomy tract. Despite a blood loss of 2L the patient maintained haemodynamic stability with mean arterial pressure between 85 to 100 mmHg without any inotropic support. Four units of packed red blood cells, 1000ml of colloid(voluven) and 1.5L of crystalloid(plasmalyte TM) constituted the goal directed intravenous fluid therapy(goal being a stroke volume variation of 10-12) during surgery which lasted 6 hours. Muscle relaxation was reversed by neostigmine 2.5 mg and glycopyrrolate 0.4 mg and patient was extubated on operation table. Post extubation, the patient was pain free and had a blood pressure of 130/ 85 mmHg, heart rate 87/min, SpO2 98% and respiratory rate of 21/min. She was shifted to the surgical intensive care unit (SICU) on oxygen by ventimask. Airleak at the end of surgery was 200-220ml/breath. This was compensated by CPAP in SICU.In the SICU, the patient remained haemodynamically stable and was kept on BIPAP intermittently alternating with oxygen by nasal cannula at 5 l/min. She was shifted from the ICU on the third postoperative day (POD), thoracotomy tubes removed on the fourth POD (after the drainage reduced to 180ml/day) and she was discharged from the hospital on the 5th POD with 2-l/min oxygen via binasal cannula after an uneventful hospital course. Lung carcinoma, breast carcinoma and lymphomas are the first, second and third most common cause of malignant pleural effusions [3Rintoul RC, Ritchie AJ, Edwards JG, et al. Efficacy and cost of video-assisted thoracoscopic partial pleurectomy versus talc pleurodesis in patients with malignant pleural mesothelioma (MesoVATS): an open-label, randomised, controlled trial. Lancet 2014; 384(9948): 1118-27. [http://dx.doi.org/10.1016/S0140-6736(14)60418-9] [PMID: 24942631] ]. Histological examination is fundamental for diagnosis and staging of mesothelioma patients. Epithelioid(commonest), sarcomatoid, biphasic and desmoplastic types are the histological categories. Biallelic inactivation of the tumor suppressor gene BRCA1-associated protein 1 (BAP1) occurs in several cancers (colorectal, renal and malignant mesothelioma). BAP1 deletion on staining and immunohistochemistry is the latest discovery, of special interest to the pathologist, and a very useful marker for a definitive diagnosis of malignant mesothelioma distinguishing it from atypical reactive mesothelial proliferations in effusions [5Cigognetti M, Lonardi S, Fisogni S, et al. BAP1 (BRCA1-associated protein 1) is a highly specific marker for differentiating mesothelioma from reactive mesothelial proliferations. Mod Pathol 2015; 28(8): 1043-57. [http://dx.doi.org/10.1038/modpathol.2015.65] [PMID: 26022455] , 6Luchini C, Veronese N, Yachida S, et al. Different prognostic roles of tumor suppressor gene BAP1 in cancer: A systematic review with meta-analysis. Genes Chromosomes Cancer 2016; 55(10): 741-9. [http://dx.doi.org/10.1002/gcc.22381] [PMID: 27223342] ]. Presence of BAP1 deletion increases cancer-specific mortality and risk of recurrence in all cancers, except mesothelioma, where it correlates with a better prognosis [7Walts AE, Hiroshima K, McGregor SM, Wu D, Husain AN, Marchevsky AM. BAP1 immunostain and CDKN2A (p16) FISH analysis: clinical applicability for the diagnosis of malignant mesothelioma in effusions. Diagn Cytopathol 2016; 44(7): 599-606. Early stage pleural mesotheliomas shows small nodules in the parietal pleura (not visceral pleura) Eventually, parietal and visceral pleurae show adhesion, and the tumor encloses the entire lung parenchyma. Preoperative evaluation of lung cancer patient focuses on the 4 Ps (1) pressure effects of tumour (2) paraneoplastic syndrome (3) pulmonary and distant metastases and (4) pulmonary effects of chemotherapy(bleomycin induced pulmonary fibrosis).Preoperative chemotherapy and thoracoscopic aspiration of pleural fluid were used to reduce the tumour size and thoracic compression in our mesothelioma patient. Surgery combined with adjuvant chemotherapy and radiation (trimodal therapy) has prolonged survival significantly [1Sugarbaker DJ. Macroscopic complete resection: the goal of primary surgery in multimodality therapy for pleural mesothelioma. J Thorac Oncol 2006; 1(2): 175-6. [http://dx.doi.org/10.1016/S1556-0864(15)31536-7] [PMID: 17409850] ]. Two types of surgery maybe employed. The first type(pleurectomy/decortication) spares the underlying lung and is performed in patients with early stage disease with the intention of macroscopic complete resection. The second type (extrapleural pneumonectomy/EPP) involves resection of the parietal and visceral pleurae, underlying lung, ipsilateral diaphragm and pericardium, and is reserved for advanced cases. Decortication, a surgical technique already in use for several years (especially for tuberculosis) has been reinvented for malignant mesothelioma patients. Pleurectomy with decortications(P/D) was developed by Dr. Robert Cameron as a lung sparing alternative to the radical EPP to treat pleural mesothelioma patients in mid-90s. The four main steps [1Sugarbaker DJ. Macroscopic complete resection: the goal of primary surgery in multimodality therapy for pleural mesothelioma. J Thorac Oncol 2006; 1(2): 175-6. [http://dx.doi.org/10.1016/S1556-0864(15)31536-7] [PMID: 17409850] , 8Rusch VW. Extrapleural pneumonectomy and extended pleurectomy/decortication for malignant pleural mesothelioma: the Memorial Sloan-Kettering Cancer Center approach. Ann Cardiothorac Surg 2012; 1(4): 523-31. [PMID: 23977547] ] of P/D are 1. Incision (posterolateral thoracotomy) – The sixth rib is removed to allow surgeons adequate access. 2. Pleurectomy – The parietal (outer) pleura is removed along with any affected tissues in the chest wall, diaphragm or pericardium.3. Decortication – The visceral pleura is separated from the lung to excise any macroscopic tumors. Sections of the visceral pleura may be removed if deemed necessary. 4. Reconstruction – Chest is sutured after Gore-Tex diaphragmatic patch/ pulmonary parenchymal sealants, is used where a substantial amount of the diaphragm has been sacrificed or parenchymal air leaks exist [8Rusch VW. Extrapleural pneumonectomy and extended pleurectomy/decortication for malignant pleural mesothelioma: the Memorial Sloan-Kettering Cancer Center approach. Ann Cardiothorac Surg 2012; 1(4): 523-31. [PMID: 23977547] ]. Modern tools like video assisted thoracoscopic surgery(VATS) have led to several surgical advances. VATS is a unique less invasive alternative to traditional P/D, with potential to remove the tumor and lining of the lung [3Rintoul RC, Ritchie AJ, Edwards JG, et al. Efficacy and cost of video-assisted thoracoscopic partial pleurectomy versus talc pleurodesis in patients with malignant pleural mesothelioma (MesoVATS): an open-label, randomised, controlled trial. Lancet 2014; 384(9948): 1118-27. [http://dx.doi.org/10.1016/S0140-6736(14)60418-9] [PMID: 24942631] ]. Major advantage is that VATS P/D uses small incisions and a camera to visualize the chest cavity (avoiding the large posterolateral thoracotomy), leading to reduced morbidity [3Rintoul RC, Ritchie AJ, Edwards JG, et al. Efficacy and cost of video-assisted thoracoscopic partial pleurectomy versus talc pleurodesis in patients with malignant pleural mesothelioma (MesoVATS): an open-label, randomised, controlled trial. Lancet 2014; 384(9948): 1118-27. [http://dx.doi.org/10.1016/S0140-6736(14)60418-9] [PMID: 24942631] ]. The latest improvement is the ventilatory strategies employed by anaesthetists to aid pleural dissection. Hypoxic pulmonary vasoconstriction (HPV) is a protective phenomenon most effective when 30% - 70% of the lung becomes hypoxic. It redirects pulmonary blood flow to better ventilated alveoli, to reduce ventilation/perfusion (V/Q) mismatch and right to left shunting [9Ng A, Swanevelder J. Hypoxaemia during one-lung anaesthesia. Contin Educ Anaesth. Crit Care Pain 2010; 10(4): 117-22., 10Hedenstierna G, Reber A. Manipulating pulmonary blood flow during one-lung anaesthsia. Acta Anaesthesiol Scand 1996; 40(1): 2-4. [http://dx.doi.org/10.1111/j.1399-6576.1996.tb04379.x] [PMID: 8904251] ]. HPV inhibitors include volatile anesthetics (halothane and enflurane >isoflurane, sevoflurane and desflurane)systemic vasodilators (nitroglycerin, sodium nitroprusside, dobutamine, calcium channel blockers, and β2 agonists), pulmonary artery pressure extremes, hypocapnia, mixed venous oxygen tension extremes and pulmonary infection [9Ng A, Swanevelder J. Hypoxaemia during one-lung anaesthesia. Contin Educ Anaesth. Crit Care Pain 2010; 10(4): 117-22., 10Hedenstierna G, Reber A. Manipulating pulmonary blood flow during one-lung anaesthsia. Acta Anaesthesiol Scand 1996; 40(1): 2-4. [http://dx.doi.org/10.1111/j.1399-6576.1996.tb04379.x] [PMID: 8904251] ]. We employed less than one MAC of sevoflurane supplemented by a BIS-guided propofol infusion during OLV to prevent awareness since propofol does not inhibit HPV [11Van Keer L, Van Aken H, Vandermeersch E, Vermaut G, Lerut T. Propofol does not inhibit hypoxic pulmonary vasoconstriction in humans. J Clin Anesth 1989; 1(4): 284-8. [http://dx.doi.org/10.1016/0952-8180(89)90028-7] [PMID: 2627402] ]. Factors decreasing blood flow to ventilated lung (high peak or mean airway pressures, high PEEP), hyperventilation, low fraction of inspired oxygen (FiO2), vasoconstrictors (dopamine, epinephrine, and phenylephrine) causing greater vasoconstriction of normoxic vessels than hypoxic vessels were factors which we avoided. We kept the expiratory times long enough (inspiratory: expiratory ratio1:2.5) to prevent development of intrinsic PEEP. The low tidal volumes (to keep airway pressures low) were compensated by increased respiratory rate to maintain the minute ventilation. Two separate catheters designated to suction each of the two DLT lumens (tracheal and bronchial) were employed besides intravenous glycopyrrolate 0.2mg to prevent secretions. Thoracic epidural anaesthesia with local anaesthetics is known to inhibit HPV and also reduce, mean arterial pressure, heart rate and stroke volume [12Garutti I, Quintana B, Olmedilla L, Cruz A, Barranco M, Garcia de Lucas E. Arterial oxygenation during one-lung ventilation: combined versus general anesthesia. Anesth Analg 1999; 88(3): 494-9. [http://dx.doi.org/10.1213/00000539-199903000-00005] [PMID: 10071993] , 13Wattwil M, Sundberg A, Arvill A, Lennquist C. Circulatory changes during high thoracic epidural anaesthesiainfluence of sympathetic block and of systemic effect of the local anaesthetic. Acta Anaesthesiol Scand 1985; 29(8): 849-55. [http://dx.doi.org/10.1111/j.1399-6576.1985.tb02309.x] [PMID: 4082882] ]. Even though we had placed the epidural catheter preoperatively, we gave only morphine epidurally(0.25% bupivacaine was administered post OLV for post operative pain relief). Keeping SVV of 10-12 as a goal for directing intravenous fluid therapy was effective in maintaining hemodynamic stability and tissue perfusion(serum lactate level 1.5mg% in post operative ABG). Ventilating the lung undergoing surgery, with large tidal volumes while the surgeon provided steady traction to the visceral pleura aided the pleural dissection Fig. (2 ). The collapse and hyperexpansion of alveoli with each breath, mechanically and atraumatically separated the pleura from the underlying lung at critical points where an electrosurgical unit(ESU) would have injured the underlying lung. Five such cycles lasting 3-8 minutes each, alternated with OLV(during which ESU was used for dissection). Maintaining apnoea with stand- still but inflated lung (end inspiratory) at critical junctures further aided surgery. Prolonged parenchymal air leak is the most common complication after lung resection (48-70% patients) [14Lang G, Csekeö A, Stamatis G, et al. Efficacy and safety of topical application of human fibrinogen/thrombin-coated collagen patch (TachoComb) for treatment of air leakage after standard lobectomy. Eur J Cardiothorac Surg 2004; 25(2): 160-6. [http://dx.doi.org/10.1016/j.ejcts.2003.11.018] [PMID: 14747106] ] and we managed to reduce this using our ventilatory manoeuvres. Prolonged chest tube drainage, pain and immobilization, infections and broncho-pleural fistulae and prolonged hospital stay are the repercussions of prolonged air leak. In one recent clinical trial, where pleurectomy/decortication was carried out by traditional surgery using ESU alone, 78% of the patients developed a paranchymal leak (mean leak of 873±257ml) [15Bertolaccini L, Lybéris P, Manno E. Lung sealant and morbidity after pleural decortication: a prospective randomized, blinded study. J Cardiothorac Surg 2010; 5: 45. [http://dx.doi.org/10.1186/1749-8090-5-45] [PMID: 20509919] ]. We managed to reduce this leak to just 200-250ml using the anaesthetists skills of single and double lung ventilation to guide and aid pleurectomy/ decortication. Static traction on pleura by surgeon aided by ventilatory manoeuvres by anaesthesiologist. For optimal ventilation and minimal post operative air leaks in a patient undergoing pleurectomy/ decortication surgery, anaesthetist must master the science behind OLV as well as the art of pleural dissection using ventilatory manoeuvres. 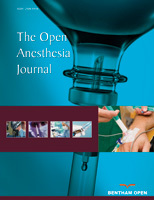 BIS guided propofol infusion and goal(SVV) directed fluid therapy are ideal for maintaining anaesthetic depth and hemodynamic stability, respectively, during OLV. Sugarbaker DJ. Macroscopic complete resection: the goal of primary surgery in multimodality therapy for pleural mesothelioma. J Thorac Oncol 2006; 1(2): 175-6. 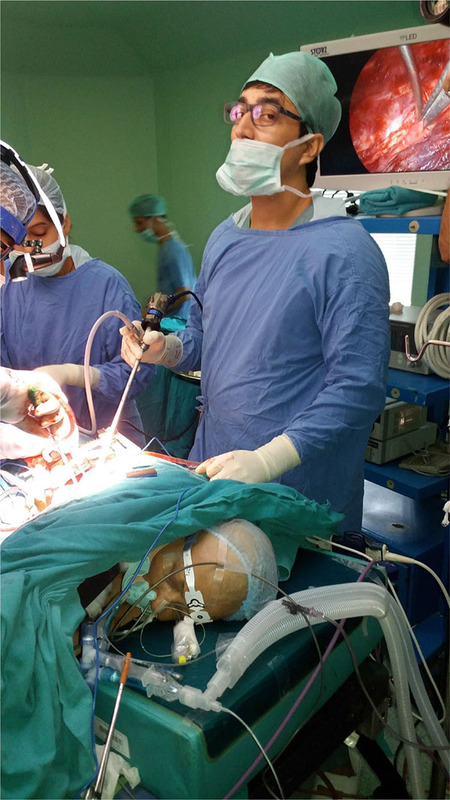 Bhattacharya S, Dubey PK, Kumari R. Intraoperative ventilation strategy in a patient with empyema thoracis complicated by bronchopleural fistula. Egypt J Cardiothorac Anesth 2016; 10: 57-9. Rintoul RC, Ritchie AJ, Edwards JG, et al. Efficacy and cost of video-assisted thoracoscopic partial pleurectomy versus talc pleurodesis in patients with malignant pleural mesothelioma (MesoVATS): an open-label, randomised, controlled trial. Lancet 2014; 384(9948): 1118-27. Roggli VL, Sharma A, Butnor KJ, Sporn T, Vollmer RT. Malignant mesothelioma and occupational exposure to asbestos: a clinicopathological correlation of 1445 cases. Ultrastruct Pathol 2002; 26(2): 55-65. Cigognetti M, Lonardi S, Fisogni S, et al. BAP1 (BRCA1-associated protein 1) is a highly specific marker for differentiating mesothelioma from reactive mesothelial proliferations. Mod Pathol 2015; 28(8): 1043-57. Luchini C, Veronese N, Yachida S, et al. Different prognostic roles of tumor suppressor gene BAP1 in cancer: A systematic review with meta-analysis. Genes Chromosomes Cancer 2016; 55(10): 741-9. Walts AE, Hiroshima K, McGregor SM, Wu D, Husain AN, Marchevsky AM. BAP1 immunostain and CDKN2A (p16) FISH analysis: clinical applicability for the diagnosis of malignant mesothelioma in effusions. Diagn Cytopathol 2016; 44(7): 599-606. Rusch VW. Extrapleural pneumonectomy and extended pleurectomy/decortication for malignant pleural mesothelioma: the Memorial Sloan-Kettering Cancer Center approach. Ann Cardiothorac Surg 2012; 1(4): 523-31. Ng A, Swanevelder J. Hypoxaemia during one-lung anaesthesia. Contin Educ Anaesth. Crit Care Pain 2010; 10(4): 117-22. Hedenstierna G, Reber A. Manipulating pulmonary blood flow during one-lung anaesthsia. Acta Anaesthesiol Scand 1996; 40(1): 2-4. Van Keer L, Van Aken H, Vandermeersch E, Vermaut G, Lerut T. Propofol does not inhibit hypoxic pulmonary vasoconstriction in humans. J Clin Anesth 1989; 1(4): 284-8. Garutti I, Quintana B, Olmedilla L, Cruz A, Barranco M, Garcia de Lucas E. Arterial oxygenation during one-lung ventilation: combined versus general anesthesia. Anesth Analg 1999; 88(3): 494-9. Wattwil M, Sundberg A, Arvill A, Lennquist C. Circulatory changes during high thoracic epidural anaesthesiainfluence of sympathetic block and of systemic effect of the local anaesthetic. Acta Anaesthesiol Scand 1985; 29(8): 849-55. Lang G, Csekeö A, Stamatis G, et al. Efficacy and safety of topical application of human fibrinogen/thrombin-coated collagen patch (TachoComb) for treatment of air leakage after standard lobectomy. Eur J Cardiothorac Surg 2004; 25(2): 160-6. Bertolaccini L, Lybéris P, Manno E. Lung sealant and morbidity after pleural decortication: a prospective randomized, blinded study. J Cardiothorac Surg 2010; 5: 45.